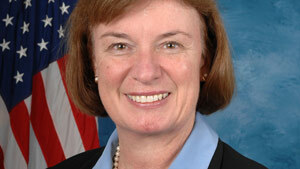 Rep. Carol Shea-Porter reportedly suggested men should be "sent home" if Congress wants to pass health care legislation. Want to get health care legislation passed in Congress? Send the elected men home, one congresswoman reportedly suggests. Shea-Porter, a New Hampshire Democrat, said as much at a Manchester town hall meeting last weekend, according to The Hill.com. It reports someone released 55 seconds of her remarks, which went viral and made national headlines. "We go to the ladies room and the Republican women and the Democratic women and we just roll our eyes," she said. "And the Republican women said when we were fighting over the health care bill, if we sent the men home. ..." At that point, The Hill.com reports loud applause interrupted Shea-Porter's remarks. She continued, "You know why? I'm not trying to diss the men, but I'm telling you it's the truth that every single woman there has been responsible for taking care of a [relatives] and so we think we can find a common ground there," according to The Hill.com. Shea-Porter is the first woman elected to national office in New Hampshire. She decided to run for Congress after volunteering in New Orleans, Louisiana, after Hurricane Katrina, according to her official biography. She has said she witnessed "firsthand the inadequate response of the federal government to meet the needs of citizens after this tragedy" and concluded she was needed in Washington. In his State of the Union address, President Obama said jobs must be the country's No. 1 focus in 2010. "Economists on the left and the right say that this [stimulus] bill has helped save jobs and avert disaster," Obama said. "But you don't have to take their word for it. Talk to the small business in Phoenix that will triple its work force because of the Recovery Act." The CEO who runs that small business is Karner, whose company is called eTec, or the Electric Transportation Engineering Corp. A company representative told CNN that eTec received $99.8 million in stimulus funds that will go to a pilot program to build electric cars and create charging stations for them in 11 cities across the country. It also is partnering with Nissan to build zero-emissions electric vehicles that have a range of about 100 miles on one charge. The eTec representative said, due to the stimulus grant, 15 jobs were created in 2009 and the company expects to hire 27 more people in 2010. Karner was one of the guests who sat with first lady Michelle Obama Wednesday night to watch the president's speech. Also in Wednesday night's address, Obama asked Congress to repeal the military's "Don't Ask, Don't Tell" policy, which bans military recruiters or authorities from asking about an individual's sexual orientation but also prohibits a service member from revealing that he or she is gay. That's exactly what Choi did in 2009 -- he came out, and on television. Six years earlier, Choi had graduated from the U.S. Military Academy at West Point, New York, and then was an infantry officer for 15 months in Iraq in 2006 and 2007. He told CNN that when fellow soldiers asked about his love life, he would lie and make references to "my girlfriend." After active duty, the Arab linguist transferred to the New York National Guard. Soon after he came out, Choi received a letter of discharge under the military's "Don't Ask, Don't Tell" policy. Later, a Guard panel recommended his discharge. Since his public announcement, Choi has become a spokesman for the rights of gay and lesbian soldiers and veterans. Choi texted CNN on Wednesday night, "The case is still pending, so this might be what saves my career and platoon. If Congress or the President ends Don't Ask, Don't Tell, then I will have a JOB again." CNN: 'Don't Ask, Don't Tell' -- don't call home? The late pope used to beat himself with a belt and sleep naked on the floor to bring himself closer to Christ, a book published Wednesday said. The pope had a particular belt for self-flagellation and brought it with him to his summer residence, according to "Why He Is a Saint: The True Story of John Paul II." "As some members of his own entourage were able to hear with their own ears, both in Poland and in the Vatican, Karol Wojtyla flagellated himself," the book said, using the name John Paul II was given at birth. Vatican insider Slawomir Oder wrote the book with Italian journalist Saverio Gaeta of the Catholic weekly Christian Family. Oder is head of the Vatican committee investigating whether John Paul II, who died in 2005, should be declared a saint. The evil albino monk in Dan Brown's "The Da Vinci Code" may be the best-known example of self-flagellation, but the practice is not unusual in Catholicism -- or nearly as extreme as it is shown in the movie. "When members or former members [of Opus Dei] see the monk go at it in the movie, they just burst out laughing, it's so nutty," said the Rev. Michael Barrett, a priest of the Catholic Opus Dei sect. In Catholic self-flagellation, "there is no blood, no injury, nothing to harm a person's health, nothing traumatic. If it caused any harm, the Church would not allow it," he wrote on Opus Dei's Web site when the film version of Brown's book came out in 2006. The wife of the former 2004 Democratic vice presidential nominee John Edwards has separated from her husband, who admitted last week that he fathered a child with a videographer who worked on his campaign, a source close to her said Wednesday. The source would not say when the separation occurred, only that it happened a while ago. John Edwards, 56, denied he was the father of Rielle Hunter's infant for more than a year, saying his affair with the videographer was over before she became pregnant. Elizabeth Edwards' sister, Nancy Anania, told People magazine in an article dated Wednesday that Elizabeth Edwards told her, "I've had it. I can't do this. I want my life back." The sister told the magazine, "She's got cancer and has young children and totally believes in marriage ... but she can only do so much." John Edwards, a former U.S. senator from North Carolina, sought his party's presidential nomination in 2004 and 2008. On November 3, 2004, the day her husband and Sen. John Kerry, D-Massachusetts, conceded the presidential race, Elizabeth Edwards revealed she had been diagnosed with breast cancer. She discovered a lump in her right breast the last week of the campaign but said she withheld the diagnosis from her husband to spare him the distraction. The noted author and social activist died of a heart attack Wednesday while traveling, according to his daughter, Myla Kabat-Zinn. The author of "A People's History of the United States" was 87. The landmark book, considered left-wing by many critics, was first published in 1980, telling a history not often seen in other books -- from the perspective of those not in power. Zinn was a shipyard worker and Air Force bombardier before going to college under the GI Bill of Rights and receiving a doctorate from Columbia University, according to his Web site. He taught at numerous universities, including Spelman College in Atlanta, Georgia, and Boston University in Massachusetts. The New York Times reports that Zinn was admired by film director Oliver Stone, rock legend Bruce Springsteen, and actors Matt Damon and Ben Affleck, who grew up near the professor and gave him a shout-out in "Good Will Hunting," their 1997 Academy Award-winning movie.